Archaeological evidence places Narragansett peoples in the region that later became the colony and state of Rhode Island more than 30,000 years ago. Native people occupied Rhode Island for thousands of years before explorers and settlers from Europe came to North America. Experts believe that around 7,000 Narragansett Indians lived in the area at the time the first European settlers arrived. Soon after the arrival of European settlers, famine and diseases brought by the new settlers greatly reduced the number of native people in the area. Most of the Native Americans were killed by French diseases and warfare with the Europeans. The Narragansett tribe: was the largest and occupied the greatest area of land; were part of loosely organized confederation of tribes called the Algonquin; with settlements up and down the East coast of North America; they divided themselves into eight divisions, each ruled by a territorial chief; these chiefs were then subject to a head chief or sachem; For subsistence, Women were responsible for planting, harvesting, preparing the food, gathering shellfish, and the building of the bark huts the people lived in; they depended on the cultivation of corn (maize), hunting, and fishing; men spent much of their time in recreational activities, assisted the women with fishing and hunting and were known for their prowess as warriors, offering protection to smaller tribes who in turn paid tribute to them. Other groups of Algonquin, included the Wampanoag and Niantic tribes, some allied with the Narragansett, and some enemies, also lived in the area that would become Rhode Island. In 1636 Roger Williams who was a minister was banished from Massachusetts Bay Colony for theological disagreements, landed on shore of present day Providence on land granted to him by the Narragansett tribe and declared it a place of religious freedom. Detractors of the idea of liberty of conscience sometimes referred to it as “Rogue’s Island”. Later he negotiates purchase of land extending to the falls at Pawtucket. Roger Williams had won the respect of his colonial neighbors for his skill in keeping the powerful Narragansetts on friendly terms with local white settlers. The Narragansett language died out for many years but was partially preserved in Roger Williams’ the A Key into the Languages of America (1643).In 1638, after conferring with Williams, Anne Hutchinson, William Coddington, John Clarke, Philip Sherman, and other religious dissidents settled on Aquidneck Island (then known as Rhode Island), which was purchased from the local natives, who called it Pocasset. By 1670, even the friendly tribes who had greeted Williams and the Pilgrims became estranged from the colonists, and smell of war began to cover the New England countryside. Pawtucket was founded in 1671 and was called the Center of Industry, because the west side of the river was the growing industrial town. In the1600s they taped into the waterpower and used it for gristmills, sawmills and iron forges. William Jencks set up his forge and did iron work using available supply of timber, nearby bog iron ore and river power. At the time of the Revolutionary War, there was a well established community of iron workers, whose products included farm tools, anchors, and then cast cannons and muskets. In 1719, Rhode Island imposed civil restrictions on Catholics living there. Jencks, Brown & Slater were considered the technological people of the age and started the industrial revolution. In 1740s William Jencks built 2 mills. In 1760s James Hargreaves invented the Spinning Jenny, which was a water wheel spinning frame replacing the hand operated spinning wheel, improving quality. This was the first successful mass production. People were excited and getting into mass production- the beginning of consumerism and losing our connection with natural processes. Prior to industrialization, Rhode Island was heavily involved in the slave trade during the post-Revolution era. In 1652 Rhode Island passed the first abolition law in the thirteen colonies, banning African slavery. The law was not enforced. By 1774, the slave population of RI was 6.3%, nearly twice as high as any other New England colony. In the late 18th century, several Rhode Island merchant families (most notably the Browns, for whom Brown University is named) began actively engaging in the triangle slave trade. In the years after the Revolution, Rhode Island merchants controlled between 60 and 90 percent of the American trade in African slaves. The 18th century Rhode Island’s economy depended largely upon the triangle trade, where Rhode Islanders distilled rum from molasses, sent the rum to Africa to trade for slaves, and then traded the slaves in the West Indies for more molasses. In 1774, a bill was introduced that prohibited the importation of slaves into the colony. This became one of the first anti-slavery laws in the new United States. Despite the antislavery laws an active international slave trade continued. In 1789 an Abolition Society was organized to secure enforcement of existing laws against the trade. In February 1784 the Rhode Island Legislature passed a compromise measure for gradual emancipation of slaves within Rhode Island. By 1840, the census reported only five African Americans enslaved in Rhode Island. Using southern cotton cultivated with slave labor, Rhode Island manufactured numerous textiles throughout the early 19th century. By the mid-19th century, many Rhode Islanders were active in the abolitionist movement, particularly Quakers in Newport and Providence such as Moses Brown. Rhode Island was the first British colony in America to formally declare its independence, doing so on May 4, 1776, two months before the Declaration of Independence. 1789 Moses Brown started his first mill, purchased all the important machines available in RI and brought it to Pawtucket. He and his family were unable to operate the machinery till they hired Samuel Slater.1793 Samuel Slater built a cotton-spinning mill, the first in the US to be water powered. He was the first to know how to build as well as operate textile machines. He hired 9 children, ages 7 to 12 as employees, and in 1796 his 30 employees were mostly preteens. Rhode Island was the last of the original 13 states to ratify the United States Constitution (May 29, 1790)—doing so after being threatened of having its exports taxed as a foreign nation. They built housing, churches, and schools for the workers to concentrate the work force within easy walking distance to the mills. They built company stores where the workers got paid with a line of credit. 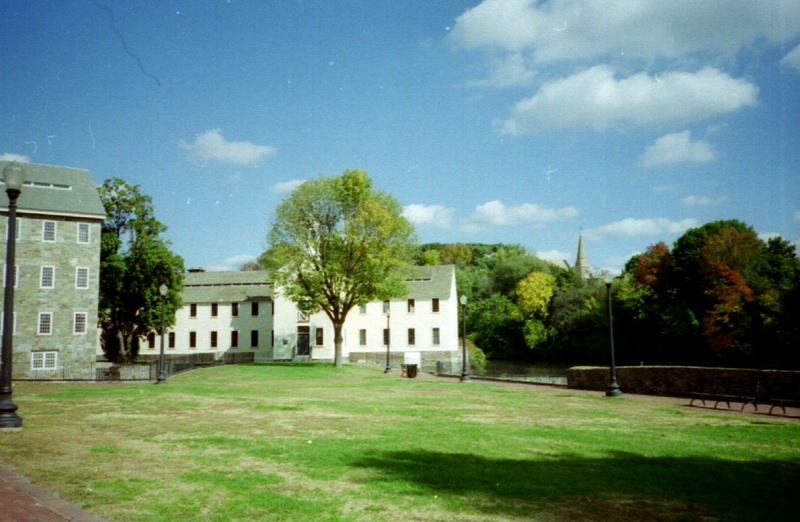 The Pawtucket Falls area quickly became the focus of textile manufacturing in the US. Both sides of the Pawtucket River developed large textile mills due to their need for water as power. As a child the downtown area had empty red brick buildings which had been mills and factories. The dams, required to provide waterpower to the mills, flooded the farmed fields and stopped fish from their annual migration. There were major lifestyle changes for these mill workers, who were mostly Yankee farmers. Farm life was governed by the seasons, the sun controlled the work day. Once in the mill, the rhythm of nature was replaced by the tolling of the factory bell. Time became a commodity to be strictly measured and sold at a set rate. The Artisan’s skills or farmer’s produce no longer had as much value as the sheer amount of time a worker was able to stand beside their ceaseless machine, while they bought stuff made by machines. The cost of industrialization, where the industrial revolution started, in Pawtucket RI, created dense populations and polluted the rivers and streams. Dirt roads, trees, and the natural lines of nature were turned into straight lines with bridges, cement and brick. Manmade structures replaced natural forms. Man creates frames and structures to confine nature, to hold nature within. This is man’s battle with nature; where man builds fences, brick walls, cement structures, roads & buildings. The Industrial revolution had consequences for society with Child labor, as children are seen as a commodity and the family structure was affected with increase divorces. During the 19th century Rhode Island became one of the most industrialized states in the United States with large numbers of textile factories. The state also had significant machine tool, silverware, and costume jewelry industries. During the American Civil War, Rhode Island furnished fighting men to the Union armies. On the home front, Rhode Island, along with the other northern states, used its industrial capacity to supply the Union Army with the materials it needed to win the war. Rhode Island’s continued growth and modernization led to the creation of an urban mass transit system, and improved health and sanitation programs. After the war, in 1866, Rhode Island abolished racial segregation throughout the state. Post-war immigration increased the population. From the 1860s to the 1880s, most of the immigrants were from England, Ireland, Germany, Sweden, and Quebec. Towards the end of the century however, most immigrants were from South and Eastern Europe, and the Mediterranean. At the turn of the century, Rhode Island had a booming economy, which fed the demand for immigration. In the years that lead up to World War I, Rhode Island’s constitution remained reactionary, in contrast to the more progressive reforms that were occurring in the rest of the country. During World War I, Rhode Island furnished troops. After the war, the state was hit hard by the Spanish Influenza. In the 1920s and 30s, rural Rhode Island saw a surge in Ku Klux Klan membership largely among the native-born white population in reaction to the large waves of immigrants moving to the state. Pawtucket is north of Providence, the 4th largest city in the state, has an elevation of 76 feet; its size is 9 square miles, making it an easy place to walk around. The city’s boundaries have remained unchanged since 1847 and became the City of Pawtucket in 1886. . A place of history, considered the home of the Industrial Revolution in America. According to the United States Census Bureau, the city has a total area of 9.0 square miles (23 km2), of which, 8.7 square miles (23 km2) of it is land and 0.3 square miles (0.78 km2) of it (2.89%) is water. Pawtucket lies within three drainage basins. These include the Blackstone River (including the Seekonk River), the Moshassuck River and the Ten Mile River. My great grandparents: Exare “Jerry” Breault born 6/12/1866 in Canada was married to Celine Audet on 7/29/1888, born 11/6/1869 in Massachusetts. My great Grandfather died on 7/6/1928 in Pawtucket, Rhode Island. My Great Grandmother died 2/14/1938 in Massachusetts. Thus you can see that my mother’s side of the family has been here for some time. I do not have much information on what they did or how they lived and would appreciate any info that you may have to share. My great grandparents had 10 children including my Grandmother Bernadette Rosanna Breault born 10/19/1899 in Pawtucket, Rhode Island. My Meme married Edmond Gevry 5/11/1919 in St John-Baptist, Pawtucket; I do not find a birth date for him, only a baptism 1/26/1894. My Meme and Pepe had six children, my mother Theresa Gevry was born on 1/13/30. Meme died 10/19/1962 in Pawtucket but I do not know when or where my Pepe died. The story goes that my Pepe built a house in Pawtucket where they lived till his death. My Pepe and his brothers moved from Quebec Montreal to the US looking for work, most of his brothers stayed in Vermont and became farmers whereas he came to Pawtucket. My Pepe was known in town for starting the first all male bar on Main Avenue. If you have any stories about my Meme & Pepe that I can share in my book I would greatly appreciate it. Pawtucket is Algonquin for river falls, the “great falls”, which is known as the Pawtucket Falls. At the falls is a short wide stretch of shallow whitewater and then it roars over the substantial falls creating a natural crossing point that was used by Indians and early settlers, to get to the other side. It is part of the Blackstone River that originates from Worcester, Massachusetts and was the natural transportation route in the area. This is one of my favorite spots along the river, standing on the bridge near the Old Slater Mill. It is polluted, we can’t swim in it and there were no sights of life in those dank waters and there is a putrid smell that is carried on any breeze, it is considered “dead” due to a century of industrial abuse. They claim you can still cross on foot, but not me because it crepes me out. I can hear the water roar over the large boulders and dam downstream over the substantial falls. This is considered the home of the Industrial Revolution in America, the place where industrialization began resulting in dense populations and polluted rivers and streams. The element of water that turned the valley into an industrial powerhouse is still present; the river, the canal, the mill villages, and the agricultural landscape. During the 1960s I was living a block away from the Blackstone River, there is run off from all the textile mills, along its banks, which is the home of the first cotton gin, creating so much pollution that there is nothing living in it. Lollygagging along its banks, peering into its filthy frothing moving waters is like looking into the murky waters of my own misery and pain, identifying with it, it is a mirror reflecting back my experiences. Going into Slater Mill, enjoying the beautiful wood weavers, that make up the gigantic looms still standing and functional, with the waterwheel as the source of energy, it must have been bustling in its day, with all the child labor, it is well maintained and admired by all visitors who have had the privilege of obtaining entrance to its inner chambers. There is lots of segregation in the neighborhood mostly based on languages: Jewish, French, Portuguese, and Greeks live in separated areas and one is expected to stick with their own kind. Downtown the red brick buildings that once were mills and factories, have more modern business in them especially the jewelry manufacturers with many more structures being empty. My curiosity and love of walking lead to me to the beautiful Pawtucket library that was the original Post Office, making reading my major activity, a great skill that eventually turns into a great coping mechanism. It transformed my life by increasing awareness of alternate realities and the ability to explored and envision a different life, a life of one’s’ own choosing. What a freeing concept that is. Being a seeker I enjoy the Process of Exploration, seeking mystery, learning investigational techniques with the love of analysis, always asking “WHY”, and yearning to follow through with courageous action. Efforts are underway to transform the Blackstone, into a fish-able and swim able river by 2015. Man realizes his effect and tried to clean it up, is it too late? Does man’s progress always have to include destruction of the environment and social degradation?